EMPHATIC is a band from – of all the places – Omaha, Nebraska. When one thinks of new rock music and its origins, one doesn’t naturally think of Omaha as a burgeoning hotbed of new rock bands or artists that aren’t country bands or singers. The name Omaha conjures up visions of stockyards full of beef cattle and millions of acres of corn, and the vast prairie land as far as the eye can see. You wouldn’t normally think of Omaha if you had a band like this in mind. In spite of their Midwestern origins, this band has a much worldlier outlook and appeal, as well as more metropolitan feel to it. This is especially true since the man at the helm with vocal duties is Toryn Green, formerly the front man of Fuel (replacing then-departed Brett Scallions, who has since rejoined Fuel), and the touring front man with Apocalyptica. The current incarnation of the band consists of Toryn Green on vocals, Justin McCain on guitars, Bill Hudson on guitars (formerly of the power metal band, Cellador), Jesse Saint on bass, and Patrick Mussack on drums. Emphatic was founded in 2004 by songwriter and guitarist Justin McCain, and shortly thereafter was signed to a contract with Universal, although they never released an album under the Universal label. In 2008, Emphatic put an EP out called ‘Goodbye Girl’, and it spent 17 weeks on Billboard’s Top Heatseeker’s Chart, but little else came of it. After some personnel changes and other delays, Justin McCain wanted to reorganize the band, and that’s when Toryn Green was brought in to sing, as well as Bill Hudson from Cellador on co-lead guitar duties. ‘Another Life’ includes many collaborations with outside artists, including ‘Sahaj’ Ticotin of alt. metal band, Ra, Brian Vodihn of 10 Years, Tobin Esperance of Papa Roach, and noted singer, songwriter, and producer Johnny Andrews. The new release, ‘Another Life’ has eleven tracks on it, and I can tell you now that it never gets boring. The first track, ‘Life after Anger’ is a good start to this album as it announces itself with confidence. I’ve always been a firm believer, at least where live shows are concerned, that a band should come out and punch you right in the nose with their first song – just to get your attention. This song gets your attention with the enormous drum track and the crisp guitar riff and tone. The vocals jump out at you; all confident and, dare I say it, emphatic. The song has a good, pulsing beat, great tones, vocals, and topped off with a catchy guitar hook and chorus. The guitar lead break is full of shredding that is tasty and slides right back into the chorus with a fluidity that speaks to solid writing and arranging. Production is top-notch on this release, although, in all honesty, it’s just a little too slick in some places for my taste. ‘Time is Running Out’ is a good, mid-tempo song that has a nice orchestral feel to the keyboard tracks in the background that lend themselves well to this song without changing the feel of the song too much. The guitars and vocals are still very much the stars of this show. Toryn has a nice style to his vocals, and his dynamics is really shining on this track. It could have been a very mediocre song if the vocals weren’t performed as skillfully as they are on this track. Also, worthy of note on this track is the counter melody the guitars play to the vocals in the bridge. It adds a nice dimension to this otherwise standard rock fare. “Lights’ has an almost Cold Play-like feel to the intro portion of the song. The changes in time signature are nice, and are done well in the sense that it breaks up the feel of the song from a straight 4/4 to an almost waltz-like 3/4 before it goes back into the straight-time part in the verses. The production on this album, as I said earlier is well done, but the vocals on this song are one of the spots where I feel they’re a little too big for their own britches. They have that 80’s ‘big arena’ production sound to them that is just a smidge too much for me. I’m a big proponent of vocals being more natural sounding and less produced. Luckily, and thankfully, the vocals are much more natural sounding on the next song, ‘Some Things Never Die’. This is a very well executed ballad and should have no trouble getting airplay. On this song, you can tell why the boys in Fuel hired Toryn to replace Brett Scallions. His voice is the standout performer on this song, but the writing behind it shouldn’t go unnoticed, as well. This is a very good ballad. This next song is my favorite song on this release, and it’s called ‘The Choice’. It has all the hallmarks of a Top-40 Rock hit. The drumming is exceptional on this track, as are the strong bass lines, but the blue ribbon goes to the writing and vocal talents on this song. Guitars are solidly played, but there are no leads on this song, and the breakdowns are as close as you’ll get to a lead on this. But no matter, the song has what it needs in it, and the lyrics are intelligent and upbeat, even inspirational. The title track of this album, ’Another Life’ has a good guitar hook, a simple melody, straight-forward guitar and bass lines, and a driving drum track. The vocals are once again the focus of this song – it has an almost dance quality to it, but the song manages to maintain its rock edge throughout. It’s a song that shows a more diverse side of the band, but it doesn’t surrender their rock roots to do it. ‘I Don’t Need You’ is similar to the title track, ‘Another Life’, but is slightly heavier in feel, with the drums and guitars in particular taking more of a front-row seat in the mix. Unlike ‘Another Life’, this song has a guitar lead, and it is very well done, if too damn short for this song. They could have let the lead run for another four bars, and I would have been happy. The acoustic guitar and vocal intro verse to ‘Louder Than Love’ sets the mood for this song that should do well as a crossover pop love song, as well as a rock ballad. Emphatic are good at writing love songs and rock ballads – it really seems to be their forte. The Cry Baby use on the guitar lead is sweet, and the entire lead is very melodic, fitting the song very well, played neither too fast, or with too many notes. Everything is ‘just right’ with this song. ‘Forbidden You’ has a big sound from the first note, and then it brings it down with the first lines of lyrics. The vocals on this song are ‘less-produced sounding’, giving the song a more open and natural feel to it, and this is the production and engineering style that I would like to see applied to the entire album. However, as they say, variety is the spice of life. The biggest variable on this entire album is a variation on effects applied to the vocals on this album. Some of the techniques used are spot on, and some are just slightly off the mark, but overall they are a credit to the engineering and production team on this album. 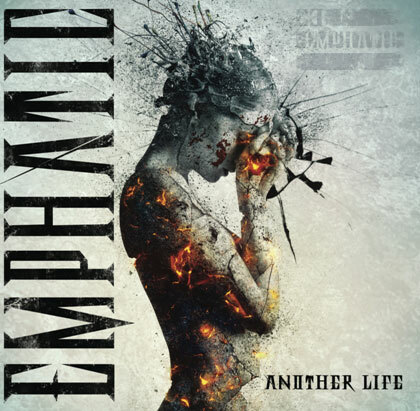 I have really enjoyed the drums and bass playing on this new release by Emphatic. They’re both played very well, performed with heart and gusto, and not once have I thought to myself while listening to this album, that there was something I wish they had done differently. ‘Take Your Place’ is a fun, upbeat song that really lets the rhythm section shine, with some nice double-bass flourishes by Patrick Mussack, and an unyielding, energetic bass part played with authority by Jesse Saint. Ironically, they chose to end this release with the first single off the album, called ‘Remember Me’. For a first single release from this album, it’s a good way to end it. Solid, heavier beat, guitars with killer tones, and a lead break that shreds, ala Yngwie Malmsteen – just not quite as long-winded or as pompously! Just kidding all you neo-classical metal-head, ‘Mr. Personality’ fans out there… Still, this is a great song for this album to go out on, and as their first released single, it should do well for them. My overall impressions are good and that the changes that were made with their personnel since their last album have had a positive effect on this release and the band’s future, as well. On a scale of 1 to 10 Skulls, 1 being somewhere in the range of Spinal Tap’s “Shark Sandwich”, and a 10 being in the range of Led Zeppelin 4, I’d have to give this album a solid 7 Skulls. Emphatic’s new album, ‘Another Life’ is due out on October 22, 2013. You can find out more about Emphatic at www.emphaticrock.com, or you can like them on their Facebook page at www.facebook.com/emphaticrock.